With the summer months behind us, so is probably one of the slowest months in terms of trading activity on the foreign exchange markets. August has proven to be a seasonal slowdown after July was more active when compared to previous years due to the aftermath of Brexit. All of the major ECNs have reported a slowdown in trading volumes with the most resilient venue when it comes to month-on-month metrics turning out to be BATS Hotspot. Fastmatch and GAIN Capital’s GTX ECN venues have declined with the swap dealer facility of GTX somewhat compensating for the decline and posting a monthly increase. FXSpotStream has marked its slowest month for the year in August, an unlikely dent in the strong data which the company has been consistently posting. 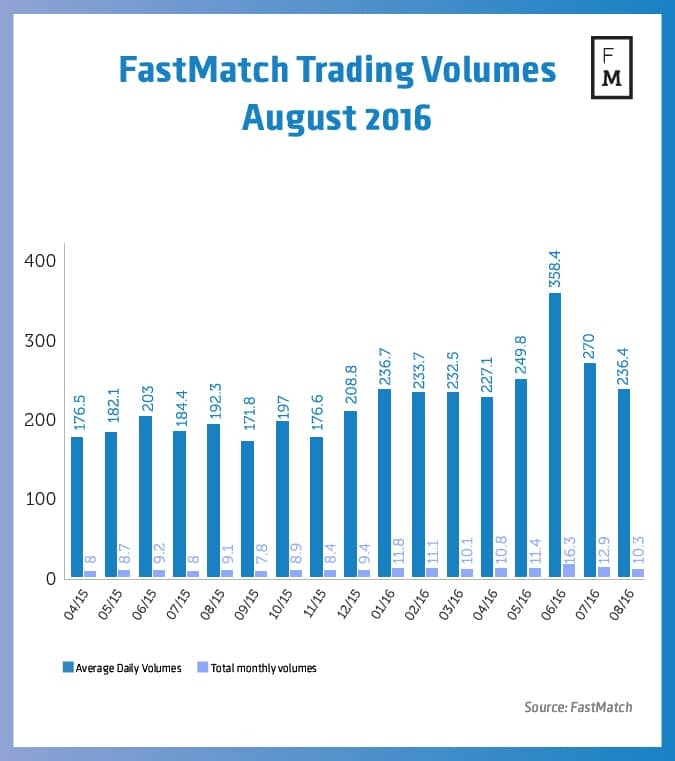 August trading volumes at Fastmatch have decreased by 12.4 per cent on a nominal basis to $236.4 billion. The figure remained higher year-on-year by about 18.6 per cent, which is a testament to the increasing appeal to Fastmatch’s offering and the weathering of the post-SNB storm for the company. 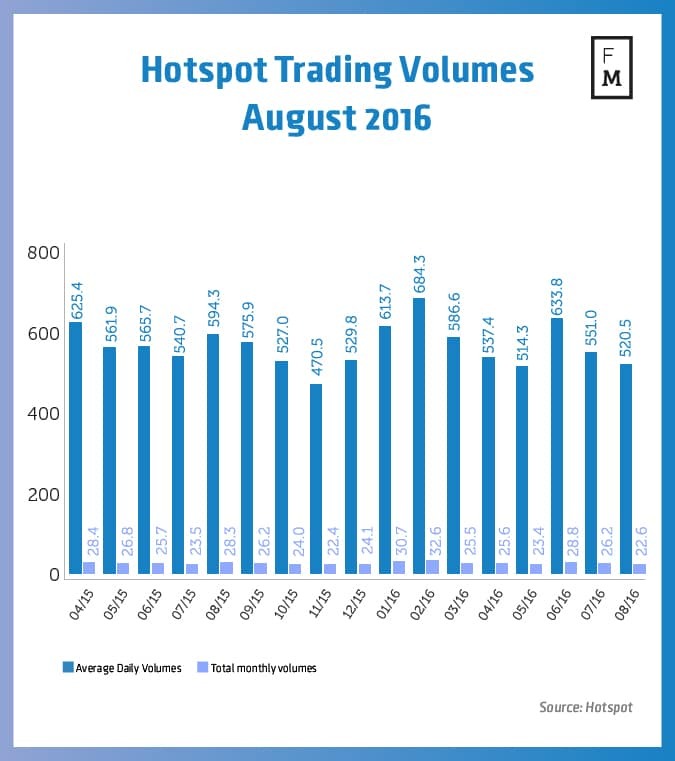 Looking at average daily volumes, the decline has been more pronounced with 23 trading days in August yielding an average of $10.3 billion daily, a figure which is lower by 20 per cent when compared to July. 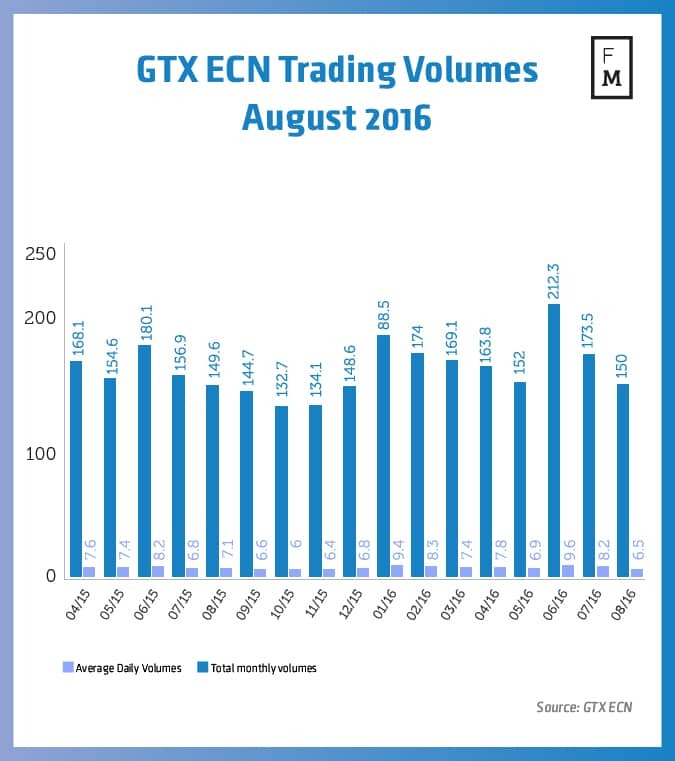 GAIN Capital’s GTX has been performing steadily throughout the year with the ECN volume for August totaling $150 billion and the swap dealer facility of the company adding another $72.6 billion. Total trading volumes for GAIN Capital’s GTX therefore amounted to $222.7 billion for the month. The monthly decline on a nominal basis for the ECN facility which also includes numbers from GAIN’s Swap Execution Facility (SEF) amounted to 14 per cent month-on-month, but was unchanged when compared to a year ago. Average daily volumes for the ECN and SEF declined 21 per cent to $6.5 billion daily, while the swap dealer facility offset the figures to rise by 33 per cent in August to $3.1 billion daily. The total average daily volume figures have amounted to a decline of 9 per cent when compared to July and have ticked lower by 5 per cent when compared to a year ago. The foreign exchange ECN of BATS Global Markets has marked a solid month in August, with the trading volume declining a touch over 5 percent in nominal terms to $520.5 billion. Looking at the year-on-year comparison the number was lower by 12.4 per cent. Looking at the average daily volumes (ADV) metrics the decline was more pronounced when compared to July, marking just over 13 per cent to $22.6 billion daily. 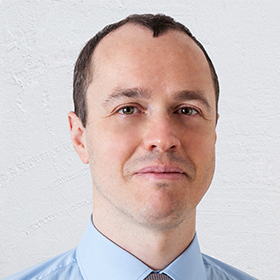 Hotspot has shown resilience when compared to its peers with its numbers typically less volatile. Looking at FXSpotStream, we are seeing the biggest decline in numbers this summer. The monthly decline on a nominal basis amounted to 30 per cent to $285.8 billion, while the average daily volumes have dropped by almost 37 per cent to an average of $12.4 billion per day. The month of August has been the slowest month for the company this year. Year-on-year, the average daily volumes numbers were lower by about 20 per cent, with the trading activity during the month being heavily impacted by the lack of volatility across major foreign exchange pairs. The only relatively active days were at the end of August when speculation about a September rate increase by the Federal Reserve has increased after central bankers telegraphed increased odds of rate hikes in Jackson Hole.